There are many advantages to installing laminate flooring in your home. It looks great, is inexpensive, is easy to install, and its durability far surpasses most other flooring options. However, despite these benefits, laminate flooring also has one major disadvantage. Laminate flooring can warp, and when it warps, the only solution is to replace the warped flooring planks. When warping happens, the look is that of something emerging from underneath the house causing peaking. Why do laminate floors get warped? There is a commonly held misconception that laminate flooring gets warped as a result of moisture having seeped down underneath the flooring, or that the home’s foundation is cracked. However, these are not typically the causes of warping in laminate floors. Rather, warping is typically caused for a few different reasons. Whatever the reason, you should always make sure you investigate the cause so you can apply the appropriate solution. One reason that laminate floors can peak or warp is a failure to provide sufficient expansion spaces during installation. Laminate flooring contracts and expands, and therefore, expansion spaces must be provided in areas where the flooring meets walls and cabinets (where molding is typically placed). Without providing sufficient expansion spaces, the flooring planks will press against each other, ultimately resulting in forcing the planks up. This peaking will only be minor initially, but over time, if not resolved, the floor will begin to rise into a hump. Another cause of peaking in laminate floors is due to the installation of fixed moldings. If you have installed your laminate flooring planks with sufficient expansion spaces but have also installed fixed moldings, which do not move, then the flooring will not get the benefit of those expansion spaces that you left. 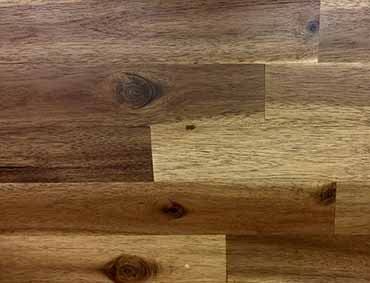 Laminate flooring is what is known as a floating floor, meaning it is not affixed to the sub floor, walls or moldings. As such, any fixed aspect of the floor can create a problem. Sometimes those performing the installation themselves as a home remodeling project end up affixing the flooring planks to the moldings to keep it stationary during installation, or because they did not do their homework and learn that they are not supposed to do so. If you did not install the flooring yourself, it can be quite difficult to figure out where the point of attachment exists, making it incredibly troublesome to locate and resolve the issue. Finally, although much more unlikely, peaking can be caused by the length of the flooring planks used. In essence, if one of your flooring boards is too long, it will have the same effect as if you did not provide sufficient expansion space. It is relatively easy to rule out this cause. If your boards do not run longer than forty feet, or if the peaking is not found in a hallway, then you can pretty much rule out long boards as the cause of your problem. But if you have ruled out every other type of cause, you may want to take a second look at how long the boards are. Do your best to determine who the manufacturer of your flooring is so you can obtain replacement boards.